Box Text: Experience high-speed explosive arcade combat. Fight through a barrage of hostile air and land-based enemies with officially licensed jets. Battle in co-op and competitive multiplayer dog fights. Customize your F-14 Tomcat with over-the-top skins, destructive weapons, and engine enhancements. Classic arcade flight combat in the palm of your hands! 05-11-2016 desocietas Box Text Experience high-speed explosive arcade combat. Fight through a barrage of hostile air and land-based enemies with officially licensed jets. Battle in co-op and competitive multiplayer dog fights. Customize your F-14 Tomcat with over-the-top skins, destructive weapons, and engine enhancements. 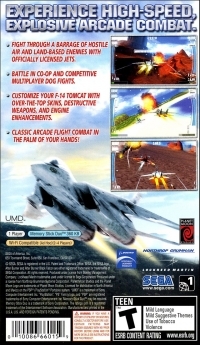 Classic arcade flight combat in the palm of your hands! 05-11-2016 desocietas Box Text Experience high-speed explosive arcade combat. Fight through a barrage of hostile air and land-based enemies with officially licensed jets. Battle in co-op and competitive multiplayer dog fights. Customize your F-14 Tomcat with over-the-top skins, destructive weapons, and engine enhancements. Class arcade flight combat in the palm of your hands! This is a list of VGCollect users who have After Burner: Black Falcon in their Collection. 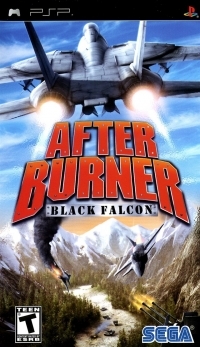 This is a list of VGCollect users who have After Burner: Black Falcon in their Sell List. This is a list of VGCollect users who have After Burner: Black Falcon in their Wish List.